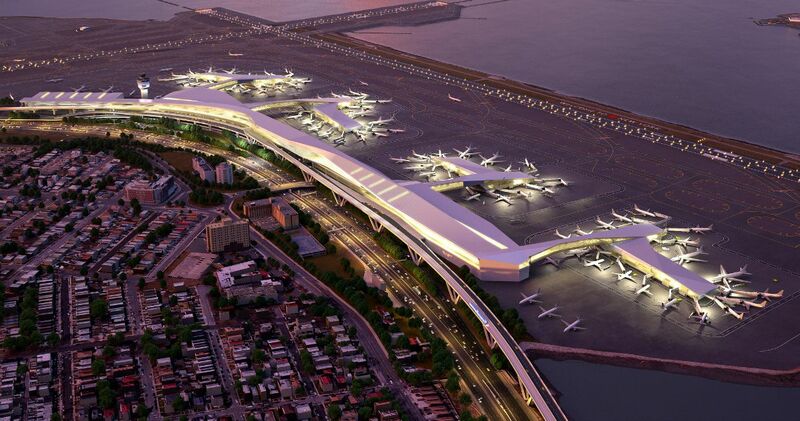 Last month, Governor Cuomo revealed his $4 billion plan to overhaul LaGuardia Airport, the third-worst airport in the country that Vice President Biden recently likened to a third-world country. While today it’s hard to imagine New York City without its sub-par airports (JFK is THE worst airport in the nation), they weren’t always a fixture in the city. In fact, LaGuardia was preceded by a much more modest facility with links to world aviation history — Glenn H. Curtiss Airport. It opened in 1929 as a private airfield off Flushing Bay; became a commercial airport called North Beach in 1935; and a decade later was changed to what we know today when then Mayor La Guardia wanted the city to have its own airport and not have to rely on Newark. Glenn H. Curtiss Airport was built in 1929 on the site of the Steinway family’s Gala Amusement Park in the North Beach section of Queens. The shoreline area was owned by New York Air Terminals, and beginning in 1925, flying began here. Two years later, Glenn H. Curtis, the famed aviation pioneer from Long Island who founded the country’s aircraft industry, bought the land as a distribution center for his Curtiss Robin light aircraft. Then, in 1929, this area plus the site of the amusement park (totaling 105 acres) was sold to the Curtiss-Wright Airports Corporation and named Glenn H. Curtiss Airport. At the time, it had just three hangars and three gravel runways, the longest of which was 2,300 feet (today’s runways are usually 6,000 feet or longer), and the waterfront location was good for both land and sea planes, according to Paul Freeman. In 1935, the city bought the site for use a light aircraft field, facility to crate exports, and small flight school. They changed the name to North Beach Municipal Airport. Not long after, the push to turn the site into a commercial airport began when Mayor LaGuardia flew into Newark Airport when his ticket said “New York.” Though Newark was the only commercial airport serving the area at the time, the Mayor made the pilot fly him into Floyd Bennett Field in Brooklyn, the city’s first municipal airport. He then gave an impromptu press conference calling on New Yorkers to support a new airport. After a failed attempt at turning Floyd Bennett into a commercial airport (Newark proved to be more accessible to Manhattan), the city decided to take advantage of the newly opened Queens-Midtown tunnel and place their sights on North Beach Airport. After a $23 million redevelopment that turned the small facility into a 550-acre modern destination, the New York Municipal Airport-LaGuardia Field was dedicated on October 15, 1939. Families flocked to the airport on weekends just to watch the gleaming silver airliners take off and vanish into the blue or swoop majestically down onto the field. A dime got you through the turnstiles to a crowded observation deck. The turnstile dimes, plus parking fees, soon added up to $285,000, The New York Times reported two years later. With other yearly revenues of $650,000, the LaGuardia “white elephant,” as its opponents dubbed it earlier, soon was operating in the black. The name was officially changed to LaGuardia Airport in 1947 after the Port Authority took control of the site. By 1951, all transatlantic fights had moved to Idlewild Airport (now JFK), and in the ’80s, the Port Authority and FAA had to institute regulations on nonstop flights to cities more than 1,500 miles away, as well as the general number of flights going in and out of the airport. And the long history of this site is definitely still not over. 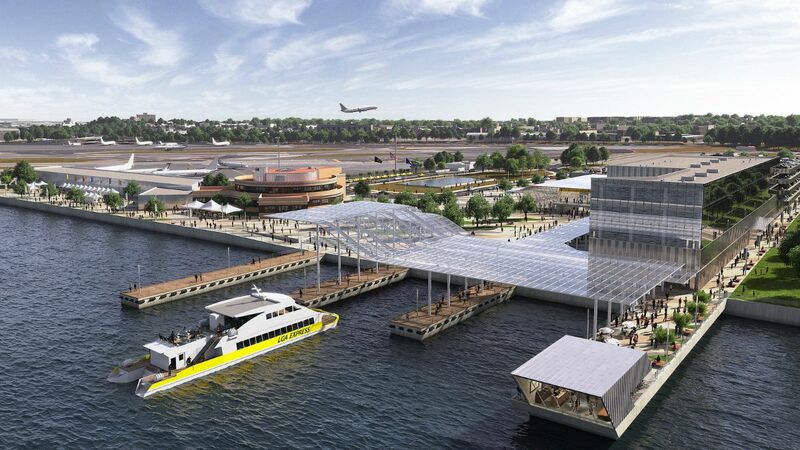 The Governor’s new $4 billion overhaul plan includes consolidating the four terminals into one hub and moving the entire facility south the length of two football fields, as well as putting into effect the controversial AirTrain, which will connect travelers to the 7 line in Willet’s Point, and adding 24-hour ferry service that will operate out of the landmarked Art Deco Marine Air Terminal. Take note that there was another nearby facility, Holmes Airport, which also played a role in LaGuardia’s history. Stay tuned for the history of this airport.